Adam Drewnowski and Allen S. Levine write in the "Journal of Nutrition" in March 2003 that added sugar and fat make up more than 50 percent of the typical American diet and contributes to the obesity epidemic. Craving sweets after a meal can hamper weight loss efforts. You try to deny the craving, only making it more pronounced. If you indulge the craving, stopping with a small serving may be impossible for you. Drewnowski and Levine point to evidence that regular consumption of foods high in sugar and fat leads to "neurochemical changes" in the brain--hardwiring you to crave these types of foods. 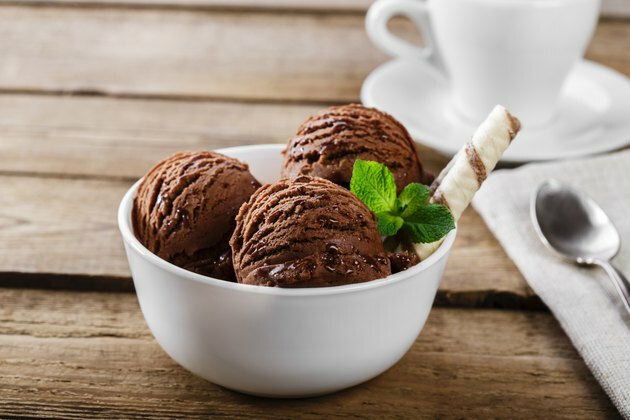 Food cravings often are a result of habit and association--if you have always had something sweet after a meal, you do not feel closure unless you meet that need. Sweet treats often are associated with rewards and positive feelings, so you feel good when you eat them. Another cause of post-meal sweet cravings has to do with the mood-elevating brain chemical, serotonin. When serotonin is low, feelings of depression and sadness set in. You crave something sweet because sugars and simple carbohydrates prompt the body to release serotonin, improving your mood. Uneven blood sugar levels cause you to crave sweets after a meal as well. If you fail to balance macronutrients at your meals and eat primarily carbohydrates, your blood sugar levels soar--only to drop suddenly shortly after the meal. Your body seeks the "high" again, causing you to crave sugar. If your cravings are due to deprivation, allow yourself a small sweet--perhaps a cookie or a miniature candy bar. Sometimes, however, this sets you up for binging, in which case it might be best to go cold turkey for a few weeks. Over time, if your cravings are due to habit, they will subside. Make sure you are consuming adequate nutrition and calories during the day. Try to make each meal contain a serving of protein, healthy fats and complex carbohydrates such as whole grains. Techniques such as brushing your teeth immediately after eating or chewing a piece of minty, sugar-free gum also may help cut the desire to consume sweets after a meal. If you must have something sweet--opt for fresh or dried fruit, which offers nutrition along with natural sugars. If you seek to cut out sugar, eliminating cookies, cakes and candy may not be enough. Manufacturers add sugar to all sorts of products, from bread to salad dressings--so read food labels carefully. Artificial sweeteners may offer you a sweet taste with little or no calories, but they do little to curb your cravings. A 2004 study at Purdue University showed that artificial sweeteners may disrupt the body’s ability to count calories, setting you up to consume more calories overall. Also, because artificial sweeteners exhibit sweetness hundreds of times more intense than sugar, they may cause you to crave sweeter and sweeter products. ScienceDaily: Chocolate Is The Most Widely Craved Food, But Is It Really Addictive? How Long Does It Take to Reduce Hunger When Dieting?